The third installment of the Scourging of Shu-Torun, this issue picks up with the heroes moving to disable the Spike, the structure that keeps Sho-Torun stable and productive. By deactivating it they can devastate Shu-Torun's contributions to the Empire without harming the civilians on the planet, the key difference between what they're doing and what the Empire did to Leia's own home. Leia and her team have successfully locked the entire planet down, so Luke is free to lead Benthic and the Partisans to take the Spike itself. The arc has continued ramping up towards what looks like an explosive conclusion fitting for Gillen's final arc of his run on the series. While there have been parts of the run that I've enjoyed less than others, I really appreciate how he has clearly written his entire run with an endgame and plan in mind the whole time. By contrast, Jason Aaron's run on the series before Gillen was much more arc-to-arc, which led to some especially nice single stories but no clear long term plan or satisfying conclusion like Gillen has done. Like the previous issues, I still don't feel much attachment for a lot of Gillen's original characters (Meorti, Tunga, and particularly Kanchar in the arc overall) but I do like Trios and her dynamic with Leia, and I especially like his use of Benthic and the remnants of Saw's Partisans. The twist at the end of the issue was fairly predictable (even without the solicitations spoiling it already) but it didn't need to be a surprise, it worked well and made me excited to see what happens next. I have been irritated by Sana's absence in the past but now that we know for sure that this isn't the end of the series, only the end of Gillen's run, I feel a bit better about it. I can understand him wanting his finale to be about his characters, and he left Sana in a place where the next writer could use her if they choose. I'm not sure if the art has gotten worse or if I've just grown less fond of Unzueta's work as time has gone on (I do think he was more suited for the environment of the last arc). The faces stick out more and more to me. I think I would prefer it if Andrea Broccardo did the art for the entire arc instead of the beginning and the end, though I am glad he'll get to do the big finale of Gillen's run. His art isn't perfect but it's the best art the series has had since Immonen fifty issues ago in my opinion. I'm looking forward to seeing where the next issue takes the arc. I'm especially excited to learn who will be taking over the series after Gillen leaves, which we should find out next week at Star Wars Celebration. 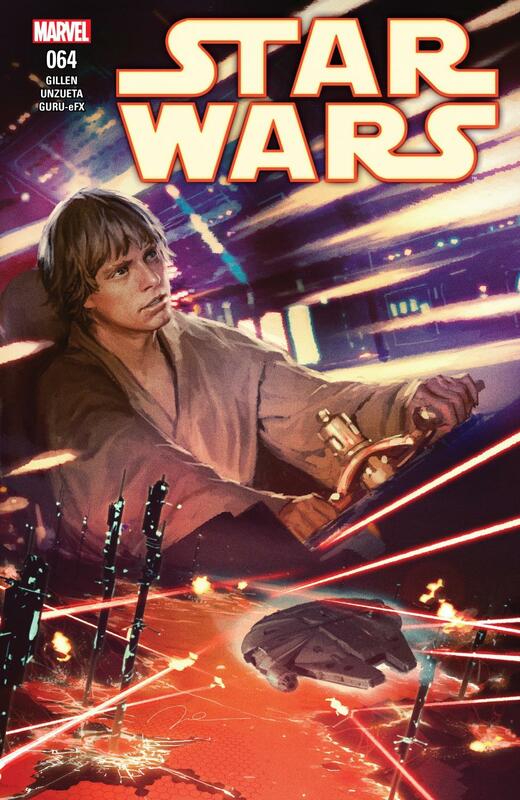 I'm optimistic that it will be Charles Soule, who has been hinting at a big Star Wars project for a while. Either way, can't wait to find out!